SESRIC launched “International Tourism in the OIC Countries: Prospects and Challenges 2015” during the 9th Session of Islamic Conference of Tourism Ministers (ICTM), which was held in Niamey-Niger between 21 and 23 December 2015. The report examines the performance and economic role of international tourism sector in the OIC member countries in the latest five-year period for which the data are available. The report analyses the two traditionally used indicators in measuring international tourism, i.e. international tourist arrivals and international tourism receipts. 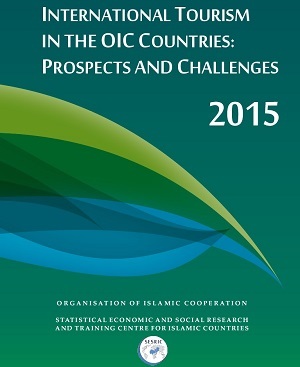 Moreover, the report provides detailed analysis on the state of the intra-OIC tourism. Islamic Tourism has a great potential for sustainable growth and significant contribution to the development of the overall tourism sector in the OIC member countries. In this regard, the 2015 version of the Report of SESRIC dedicates a special section to highlight the “Islamic Tourism”, as a new direction in the tourism sector in the OIC member countries. Finally, the 2015 version of the Report of SESRIC discusses in details the potential role of the Public-Private Partnership (PPP) modality for the development of the tourism sector in the OIC member countries. Overall, the report sheds light on the challenges of tourism development in the OIC member countries and the issue of tourism cooperation among them and proposes some recommendations to serve as policy guidelines. During the 9th Session of Islamic Conference of Tourism Ministers (ICTM), SESRIC also made a presentation on Islamic Tourism in the special session on “Islamic Tourism in the Member States” in which the stance of Islamic Tourism was reviewed and discussed by senior experts from the OIC member countries. Apart from delivering two presentations during 9th Session of Islamic Conference of Tourism Ministers (ICTM), SESRIC actively contributed to the selection of OIC Capital City of Tourism by providing detailed scoring results to the selection committee on the nominee cities. According to the results of the selection committee, the Ministerial Session adopted Madina al-Munawarra (Kingdom of Saudi Arabia) and Tabriz (Islamic Republic of Iran) as the OIC Capital City of Tourism for 2017 and 2018, respectively.